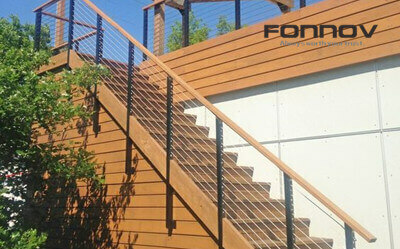 Fonnov introduces wood grain finish on aluminum. Wood Grain Finish On Aluminum can be commonly seen in Railing, Decking, Fencing, Gates, Screens, Windows, Doors and Wall Claddings. There are mainly two methods for forming wood grain finish on the aluminum surface: SUBLIMATION PROCESS and POWDER ON POWDER PROCESS. SUBLIMATION PROCESS (famous as Decoral, and we call it Wood Grain Heat Transfer Process)：The transfer of a pigment from a carrier (paper or film) into the prehardened base coated aluminum surface to create the texture by using heat and vacuum. POWDER ON POWDER PROCESS (famous as Naturall): When the base coating on aluminum surface is cured, a second thinly applied and differently colored powder is applied via a matrix, which contains the desired structure formed by very fine holes. The second powder, generally in a darker color falls through the holes onto the aluminum surface to create the texture. SUBLIMATION PROCESS technology makes the surface smooth. POWDER ON POWDER PROCESS technology has a wood grain feel. If you want to have a wood grain feel by SUBLIMATION PROCESS, you can get it by other machining fabrication, such as shavings, engraving, brushing, etc. SUBLIMATION PROCESS (Wood Grain Heat Transfer Process) to get wood grain aluminium is the most commonly used technology for aluminium industry in China. aluminum pretreatment → base-color powder coating & curing → wood grain transfer paper covering → curing → paper removal. This process can give you a clear and realistic wood finish on aluminium. 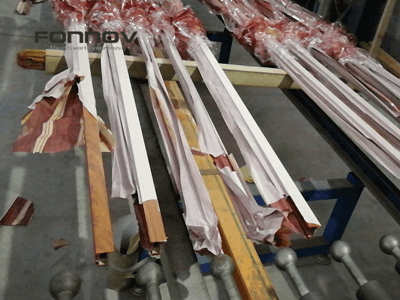 FONNOV ALUMINIUM should emphasize that the guidance of the powder coating factory and the wood grain paper/film factory is necessary for a high-performance wood grain. Otherwise, you may get a unclear texture. We have produced more than 1000 kinds of wood grain finish, you can click Wood Grain Colors from FONNOV ALUMINIUM to see this VIDEO on some wood textures.